Collaborative functionality is increasingly prevalent in web applications. Such functionality permits individuals to add - and sometimes modify - web content, often with minimal barriers to entry. Ideally, large bodies of knowledge can be amassed and shared in this manner. However, such software also provide a medium for nefarious persons to operate. By determining the extent to which participating content/agents can be trusted, one can identify useful contributions. 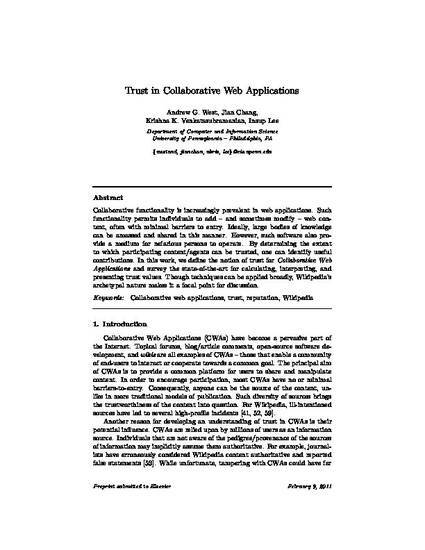 In this work, we define the notion of trust for Collaborative Web Applications and survey the state-of-the-art for calculating, interpreting, and presenting trust values. Though techniques can be applied broadly, Wikipedia's archetypal nature makes it a focal point for discussion.